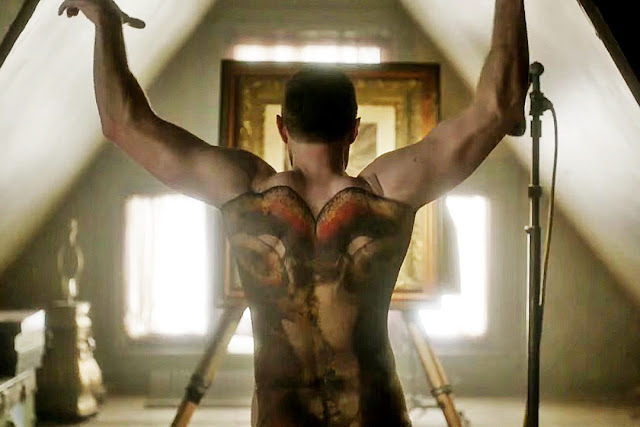 Kiss My Wonder Woman: RECAP: Hannibal 3x08 - Where Did the Time Go? 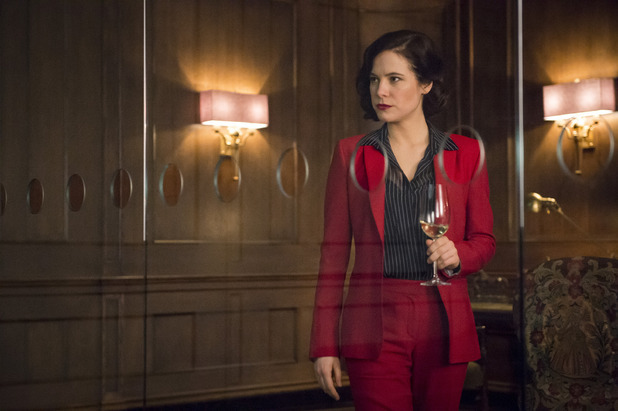 Quick reminder that we have Kyla Furey of Feedback Force doing weekly Hannibal recaps for us right now because she is awesome. This is the first episode of Hannibal in a long time (maybe ever) that left me feeling unsatisfied, uncertain, and - dare I even say it - disappointed. It’s a shame, really, because this episode has a lot to recommend it. It’s got an absolutely wonderful and intriguing first performance by Richard Armitage as Francis Dolarhyde, the Red Dragon. It’s got one of the most interesting and disturbing crime scene re-creations in a long time* (although that might just in part be contrast from not having seen one in so long), and it had the smile-inducing return of Team Sassy Science with Scott Thompson and Aaron Abrams (Price and Zeller, respectively). Hannibal’s in jail, with Alanna and Chilton as his nominal keepers. He seems only vaguely interested in them, more bored than anything else. Alanna, at least, seems very aware of the danger he could still potentially pose. Chilton is, well, Chilton. Meanwhile, a series of gruesome murders have begun and Jack Crawford has once again reached out to Will Graham to help solve them. Will has been away from the business for three years and has found and married (or is at least living with) a lovely woman named Molly and her son and all the dogs. He comes when Jack calls, but very reluctantly. Unfortunately, his efforts and the combined forces of Will, Jack, and Team Sassy Science are pulling up nothing of use, and so Will is forced to re-visit Hannibal in order to regain the mindset he needs to really get into the brain of this killer. That’s all that technically happens in this episode; it literally ends on the start of the scene re-uniting Will and Hannibal. There’s a lot of surreal character-defining sequences with Richard Armitage that are amazing and animalistic and truly bizarre in some instances** and really give a strong sense that “Oh, this guy is straight-up crazy.” But those are just mood scenes that give us very little actual information about the man behind the Red Dragon (or the “Tooth Fairy,” as the media apparently calls him). There is a very strong implication in this episode that people have changed. Hannibal is different - he is more withdrawn, less arch. Will is certainly different, given that he’s apparently having trouble coming to grips with the psychotic mindset the way he used to. Not to mention, you know, the whole “family” thing that he’s finally apparently achieved. But my question is, how did we get to this point? What happened in those three years? This show has always been so on-point with its emotional arcs, so driven in terms of really letting us feel the characters. It seems crazy that so much emotional character development just happened off-screen, and we’ve gotten not an inkling of it. When we last saw Will, he was psychotic and unstable enough not only to follow Hannibal to his own death, but to willingly and randomly (okay, not entirely randomly, but still) bite off a piece of a man’s face. How the hell did he get from there to the point where he was stable enough for a family? Where he is far enough removed from death and violence that he can’t readily summon it anymore? What even is his current mindset? 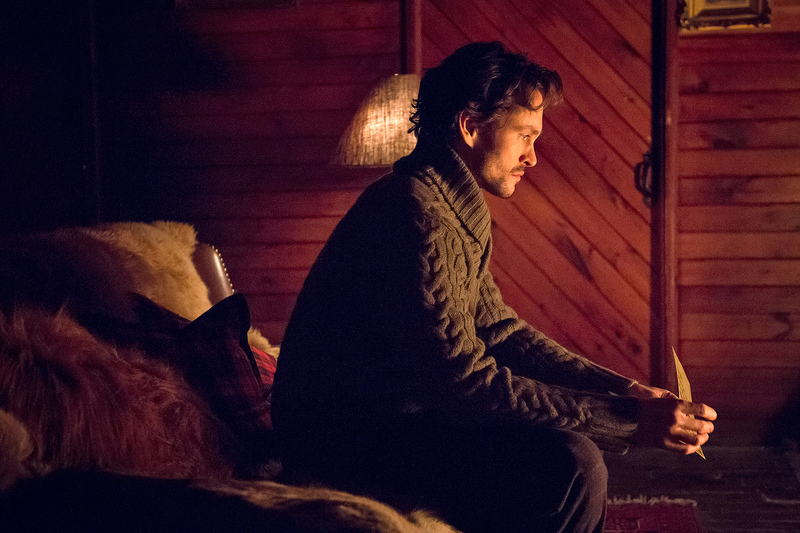 Was the last time we saw him his rock-bottom, or did he have further depression to spiral into without Hannibal before he could start to recover? We see into him so much less this episode than in any other since maybe the first season. And what about Hannibal? How does he feel about being in prison? What was his emotional journey like since his capture? Is he really bored, or just waiting? Is he angry? Was he, in the beginning? Does he miss Will? Or has he come to terms with not seeing Will? Where is his head at? Again, so much of this show is usually spot on with the character emotions that I feel completely adrift after this episode. I don’t know what I’m supposed to be feeling, which has never happened to me before with this show. I don’t know what any of the characters are feeling, which is unheard of. I really think the show needed another episode between the last one and this one. Maybe we could’ve pruned some space out of the tone-setting early episodes of the season and placed it here. 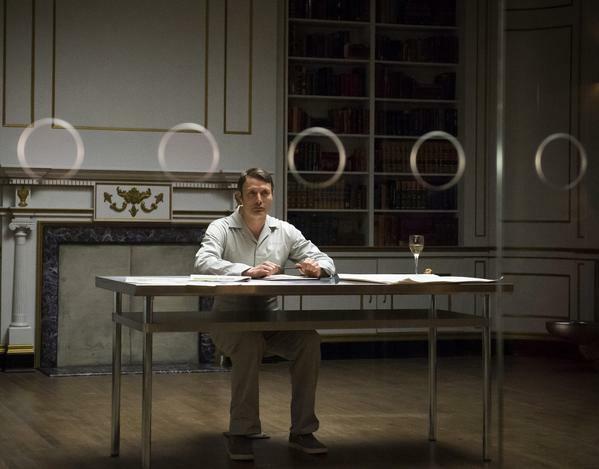 I want to see Hannibal’s descent into the darkness of captivity as paralleled with Will’s journey back out of it. I want to see Will meet Molly, and figure out who he has to be around her to manage this concept of “family.” I want to see Hannibal play with the press, and then get bored of it. I want to see Jack have the option to approach Will and decide against it. I want to see Will intentionally distancing himself from anything crime- or violence-related. 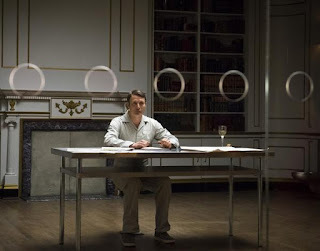 I want to see Hannibal pining after Will in prison. For heaven’s sake, the first half of this season was a drawn-out, tension-filled five episodes before Will and Hannibal even saw each other again, and that was after an absence from each other of only a few months. And now, when they haven’t seen each other for literally years, we get basically a single scene of Will saying, “Well, I guess it’s time for me to see Hannibal again,” and boom, there he is? **** It just seems so abrupt, so unrelated to everything this show has been so far. My hope is that we’ll get part of this emotional back-story as flashbacks as we go further into the season, but I have a sneaking suspicion that that’s not where the show intends to go. 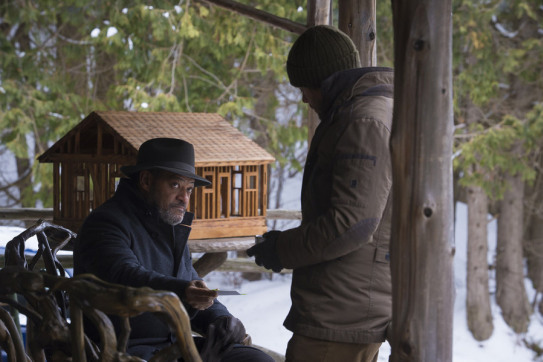 I know this show’s days have always been numbered and they were really in a rush to get to the Red Dragon stuff, but I really think you could have had, if not a whole ‘nother half-season, then at least an episode or two of how the time apart changed Will and Hannibal to help ground us in the now, and make this reunion truly mean something. * My favorite part of this is that when Will enters the scene, his flashlight becomes a “window to the past” (as Bryan Fuller put it) that allows him to see the fresh crime scene in little circular splashes of light that disappear as the flashlight swings away. ** My favorite part of his sequences was the scene where his head becomes a film projector, wrapped up in old celluloid like bandages and projecting light from his eyes and mouth. *** That and, I’m sorry to say, Molly. Or at least her actress. This isn’t a crazy shipper Hannigram thing; I really want to like Molly. I think Will needs something healthy for him, at least for a while. (Plus anyone who thinks that someone else can fill the spot in Will that Hannibal fills is just kidding themselves.) I just don’t think the actress has really got the timing of this show down. All of her lines felt really rushed to me; she didn’t give them the time to breathe and settle that the dialogue on this show is famous for and really requires at this point. Hopefully we’ll see more of her that will change my mind. **** I guess technically we get a letter from Hannibal earlier, but again I have so little idea of what either of them are thinking surrounding that letter that it almost doesn’t even count.